I have wanted DMX to win ever since I heard his studio album It’s Dark and Hell Is Hot. He rapped with so much force and aggression, it was hard not to champion whatever cause he was yelling for. This is why it saddens me to find out that DMX is on his way back to jail. TMZ reports that the rapper, whose real name is Earl Simmons, was ruled a flight risk Tuesday by a judge in a court in New York City’s Manhattan and taken into custody after testing positive for opiates, cocaine and oxycodone. 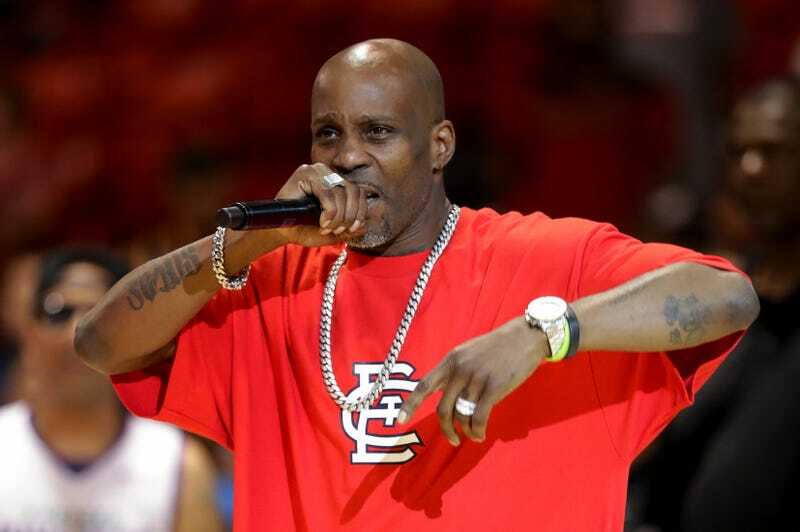 DMX was out on bail on his tax-evasion case, and as part of that arrangement, he was supposed to be completing a rehab program. He had been given the OK to travel for performances. After an appearance alongside rapper E-40 last week, video surfaced of the X at a Chili’s in the St. Louis airport doing his best drunken-preacher routine. Witnesses said he bought shots for everyone in the bar. Prosecutors referenced that video in court Tuesday, since getting drunk is also considered a probation violation for X. His lawyer, Murray Richman, told TMZ, “I’m saddened and disappointed. We’ll have to deal with it accordingly,” adding that he would try to get the rapper back into a rehab program. The judge on Tuesday said that DMX told a “great big lie” when he agreed to the terms of his bail release. X is set to be sentenced in March.